Knock, knock! I am *finally* doing my first check-in … barely sneaking it in at the end of the month! Whew! So when I made my list I knew which books I needed to knock off first. You know, while you still have that fresh, first-of-the-year, read-everything-in-sight feeling? Isn’t there just something lovely about the first of the year and the great prospects it brings with it? I sometimes wonder why we have to have the first of the year for that feeling, but I sure do. Anyway, off topic. So in January I managed to finish my first (and likely most difficult just due to its sheer size) book for this challenge. I read W.E.B. 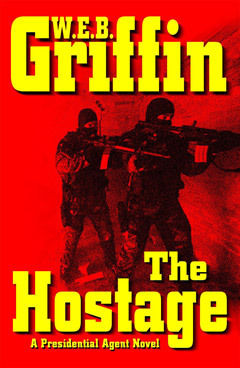 Griffin’s The Hostage. This book had set on my shelf since early 2009. It did nothing but intimidate me every time I looked at it. Add to the fact that this book is 750+ pages. I picked it up first because I knew I needed the first-of-the-year, read-everything-in-sight momentum to tackle it. I hope everyone is having a great start to this challenge, I know I’m glad I got that book out of the way first. I feel like I’m off and running now!